JOHANNESBURG, South Africa (CNN) -- African leaders gathered for a weekend summit in South Africa on Saturday as hundreds protested nearby, angry at the inclusion of Zimbabwean President Robert Mugabe. 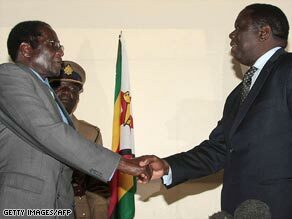 Robert Mugabe (left) and Morgan Tsvangirai met last month for the first round of talks. The protesters planned to march to the summit venue in Johannesburg to call on the leaders not to recognize Mugabe as a head of state after June's widely discredited presidential runoff that returned the longtime president to power. Zimbabwe's political crisis is expected to dominate the summit of the 14-member Southern African Development Community (SADC), a regional group set up to promote democracy and economic growth in the region. South African President Thabo Mbeki, SADC's appointed mediator for Zimbabwe, had hoped to host the summit having clinched a power-sharing deal between Mugabe and opposition leader Morgan Tsvangirai. But after weeks of back-and-forth talks among the parties, Mbeki has been unable to get them to agree. Inside the summit venue, Mugabe sat on the dais along with the other invited leaders, while Tsvangirai sat in the audience with other guests. One leader was missing from the line-up -- Botswanan President Ian Khama, who said he was boycotting the summit because he considers Mugabe's presidency illegitimate. Talks on Zimbabwe are continuing throughout the weekend on the sidelines of the summit, but the sides appeared far from reaching a deal. The sticking point is how much power Mugabe would retain in a future unity government. Tsvangirai's Movement for Democratic Change disputes the result of the June runoff, condemned internationally as a sham. Tsvangirai pulled out of the race citing political violence and intimidation, but Mugabe went ahead with the vote and declared victory.